Home / Artificial Intelligence / Machine Learning / Services / Technology / What are the Sentiment Analysis Interesting Facts? Nowadays sentiment analysis is helping to understand the opinions and comprehend of the people to manage the reputation and brand image of the companies, products, services and business organizations. And AI-backed analytics are providing more precise data generated through various online platforms to make the sentiment analysis more useful. Before we start implementing the sentiment analysis tools on various platforms you need to know the sentiment analysis facts to find out how media analysts are using this technology to cognize the public opinions and their sentiments towards different things. So, below we have discussed few interesting facts and how AI-enabled this technology is changing this field. The best use of sentiment analysis is study about the opinions, attitudes, views and emotions of the people who express their feelings in the form of texts, images and other contents. And analyzing of such contents that can be available through various sources like email, newspaper article, or social media post expose the attitude of its author towards a topic. This is also called opinion mining and sentiment analysis can be used by social scientists to understand how different types of people react towards a particular developments or events. Celebrities, authors and artists are using sentiment analysis to measure the perceptions of their audience towards their work. And best part of sentiment analysis is marketers use this technology for a particular brand to find insights through media coverage and social media posts that helps to improve their product offerings and services making their marketing efforts more productive. Nowadays millions of users are posting new contents every second on social media and many of them also talk about brands. Social media is the best platform where people are open to express their views, opinions and feelings that are loaded with their deep sentiments. And analyzing such useful contents by companies provides a best opportunity to extract the valuable amount of data for improving their products and service offerings. Sentiment analysis through social media channels helps to measure the impacts of their campaigns and events on targeted markets. The positive and negative sentiments can be easily identified with the tools and techniques allowing companies to improve future campaigns, or change their products or services offerings at best level. To analysis the sentiments various methods can be used but AI technology based sentiment analysis techniques can automatically analyze the sentiment of audience. And if AI is used in the combination of natural language processing and machine learning techniques the results will be more accurate and allows computers to learn new data and respond with more accuracy. Cogito is the one the companies that offers sentiment analysis services by developing an intelligent Sentiment Analysis algorithm to provide accurate data labeling services through trained professionals. 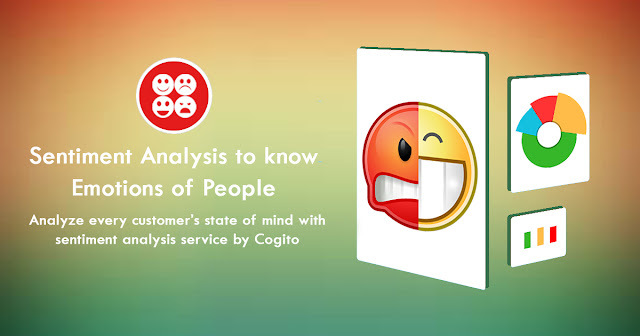 Cogito also use latest language processing engine to analysis system and give the best service of understanding the sentiments of people from different genre.